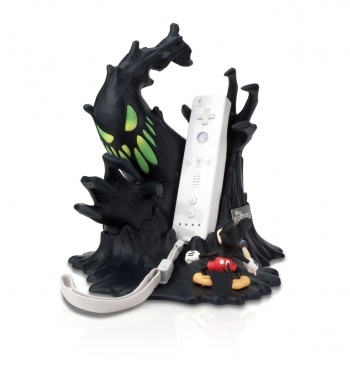 If you're planning on getting Disney Epic Mickey, you might want to look into picking up these amazing accessories for your Wii Remote as well. Nintendo revealed a metric crapload (bigger than a regular crapload!) of new games during its E3 2010 press conference, and one of the titles making a splash was Warren Spector's Disney Epic Mickey. If you're planning on picking up Epic Mickey (and let's face it, if you have a Wii and are reading this you are probably planning on doing so), you might seriously want to look into the peripherals that Disney just announced. Disney is offering a pair of promotional items created by Performance Designed Products to celebrate the videogame return of its iconic mouse. The first, pictured here, is an amazing-looking Wii Remote charger depicting Mickey squaring off against his nemesis (and the game's villain), the Evil Blot. It charges your Wii Remote, it glows in the dark, and it makes one hell of a conversation set-piece, too! The second, which you can see here, is a paintbrush shell for the Nunchuck adapter. It's not quite as awesome as it would be if it fit on the actual Wii Remote itself (which you will presumably be using to do the painting), but it is still pretty goddamn badass. No word on pricing yet, but holy crap guys, these are awesome. Do want. Do very want. Look for an E3 2010 look at Epic Mickey soon.